Edward Sylvester Morse patented his air heater in 1881. It is still a great design with a versatile vent system. A simple glazed box on the south wall with a dark absorber, an air space, and two sets of vents at top and bottom, to the outside air and the inside of the house, this is a basic air heater that can be modified for wall or window. Edward Sylvester Morse built at least three of these. One was at the Peabody Museum in Salem, MA and used an iron absorber panel. The second had a slate absorber and was on his own home, also in Salem. The last was at the Boston Athenaeum. He also lectured on the topic at MIT and published a pamphlet on his solar air heater findings. ES Morse was a remarkable gentleman. Not only did he teach at the Essex Institute in Salem, MA but he lived and taught in Japan and traveled to China. His book, _Japanese Homes and Their Surroundings_, is still in print and a great primer on traditional Japanese culture. He was a president of the American Association for the Advancement of Science and wrote wonderful reports on topics as diverse as noise pollution, archaeology, and natural science. I especially enjoyed "Fireflies Flashing in Unison." 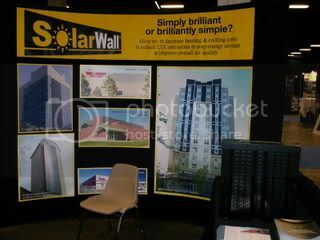 SolarWall is a modern adaptation of Morse's idea. It is an unglazed perforated absorber. A fan draws outside air through the absorber and into the heated space. It gets up to 75% thermal efficiency they say. 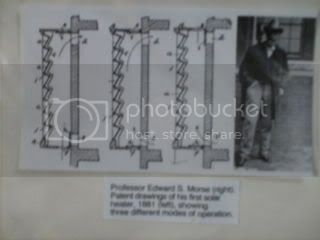 Solarwall uses the air flow pattern shown in the leftmost illustration of Morse's patent. The TAP (Thermosiphon Air Panel) is an example of the middle illustration, cycling room air past the absorber in a closed loop, full heating mode. The third illustration shows an air chimney from the floor of the room to the top of the absorber, a cooling technique. I'd like to see a Morse collector with modern materials, PV fan assist, and controls that monitor and maximize the vent system. Could be interesting.